February was another strong month for job growth, according to EMSI’s forecast. Our model shows that employers added 212,000 net jobs in February, an estimate that includes total non-farm payroll employment (government included). When factoring in the BLS’s revised numbers, the annual average change in employment is 267K (since February 2014), and this quarter (since November) was the strongest part of that year, reaching an average of 307K. Real GDP grew 2.2% in the fourth quarter of 2014, which is 15% lower than the advanced estimate. Personal income increased during January 2015 by 0.3%, which is equal to the December rate. Initial unemployment claims increased by 11,500 last week, but the four-week seasonally adjusted average decreased around 9,370 from the previous month. 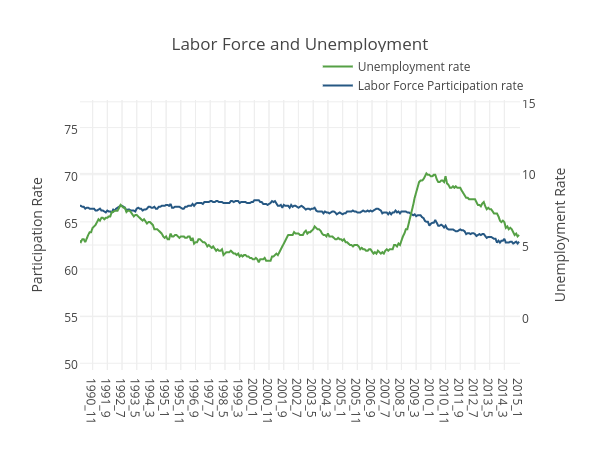 When we look closely at the last couple of months, it seems the labor force participation rate is growing faster than the unemployment rate is falling; the participation rate from December 2014 to January 2015 grew from 62.7% to 62.9%, and the unemployment rate went from 5.6% to 5.7%. However, from January 2014 to January 2015, the unemployment rate decreased 0.9%, and the participation rate during the same period hardly changed (63% to 62.9%). When looking at the year-to-year numbers, we see that the participation rate is experiencing a steady decline rather than the improvement that we might expect as we recover from the recession. Between February 2001 and January 2008, the labor market improved by 5.6 million new jobs. That was before the recession hit. Then, from January 2008 to January 2015, we added only 2.5 million new jobs, leaving us with a shortfall of 2.7 million jobs that we would have had if the recession hadn’t happened. 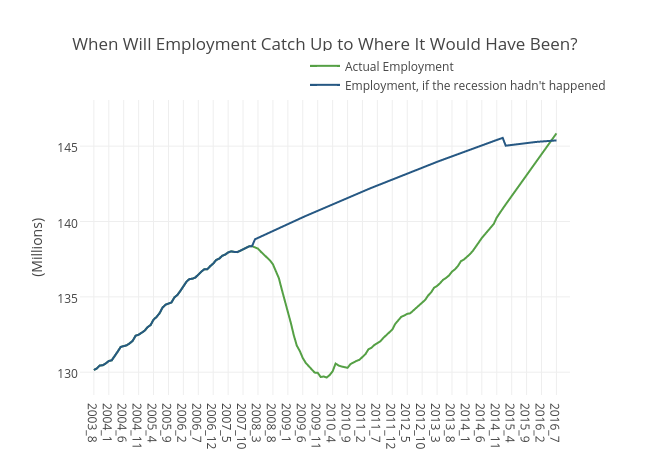 When will employment catch up to where it would be if the recession hadn’t hit? According to EMSI calculations, we can expect to catch up to where we would have been by June 2016.